That’s the slogan on a sign displayed in Christopher Bontjes’ piano lab at Judith Giacoma Elementary School in Westville. Apparently it’s also a motto that Bontjes’ students have taken to heart when learning to play piano for the first time in his class. Earlier this week, nearly two-dozen first-graders listened with rapt attention as an animated Bontjes — who also is known locally as a magician — explained that the black keys on a piano are arranged in groupings of two keys and three keys, forming a repetitive pattern across the keyboard. He then showed the youngsters how to find middle C on their keyboard and how to properly hold their fingers. The children also seemed genuinely intrigued when Bontjes’ shared with them that upside musical notes are meant to be played with the left hand. “That’s so cool!” first-grader Quinn Melecosky exclaimed. A year ago, the Westville school created a piano lab using money earmarked for technology to purchase 24 electric pianos that are networked together to allow for classroom instruction. 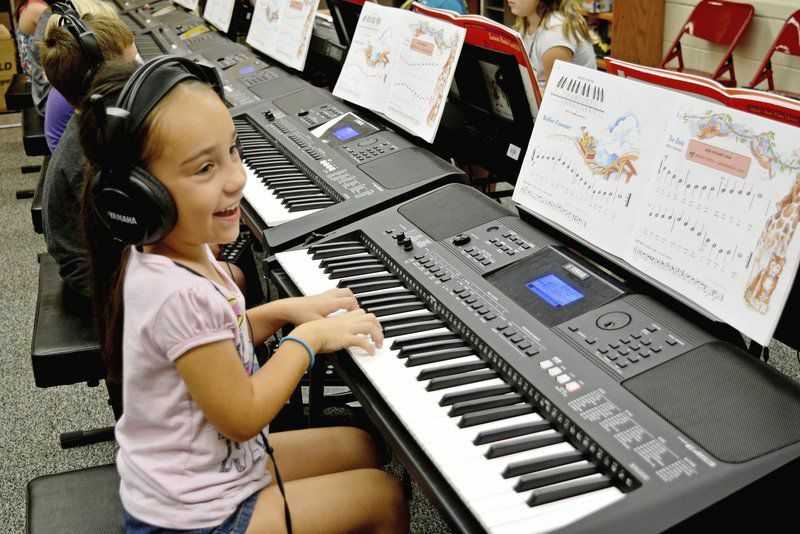 Each keyboard is outfitted with a high-quality headset and microphone so students can receive instruction and practice individually or in groups, as well as communicate with Bontjes. “The kids wear headphones, so they can hear only themselves and work at their own pace,” Bontjes explained. “Or I can set it so the kids can hear each other over the headphones, or I can configure it so members of a group can work together on a piece of music,” he added. Visitors to the piano lab, however, hear silence because the sound of the pianos can only be heard through a headset. Bontjes — who is in his 27th year of teaching, the last nine of which have been at Judith Giacoma — said he was first introduced to electric pianos while in college, but over the years, electric pianos have become more advanced and useful for instruction. Westville’s piano program is similar to Danville District 118’s violin program that launched in 2015; however, Bontjes said there are some differences. Bontjes teaches piano to all 735 students from kindergarten through sixth grade at Judith Giacoma and sees each child once every fourth day. Just in their first year of instruction, the students learned to correctly read and perform music, he said. “We had a full school recital at the end of the school year, with each grade level having a half-hour to perform,” Bontjes said. “It was very well received by the parents. This year, Bontjes is optimistic the students will continue their study of music and of the piano and progress in their skill as music readers and performers. In fact, Bontjes said the children retained much of what they had learned last school year and hadn’t lost much ground during the summer. “They’re remembering much faster than when they were first learning it,” he said. Back in the piano lab last week, Bontjes tried to encourage the first graders to look at their sheet music and not at their fingers while playing the piano. This lesson called for a little humor. “I promise your fingers won’t jump off your hand,” he said, eliciting a room full of giggles. Most of all, though, the Westville piano program seems to be nurturing a new generation of music lovers. “I like to play the piano,” first-grader Aubrey Siciliano stated.